2010 sees the database now containing details relating to 3,691 cars, the biggest addition has been a whopping great 427 cars now listed under the Y registered category, with Y registered Coventry cars being listed. The Coventry registered cars must be regarded as one of the most important lists as it contains many registered prototypes and 'firsts' from the production run. Very exciting to have registered first production cars of the Saloon, Coupe and Twin Carb Saloon. We also have details for a Van and Estate, which we will assemble in due course with some exciting new images of these cars. Surviving Convertibles have been listed, with a figure of survivors at 60 probably higher than most people would expect of this though, only 10 are confirmed as UK cars, which keeps the scarcity of the early convertible. 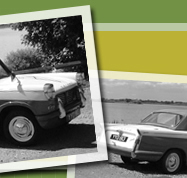 Production figures for the convertible were only 8,258 with the earliest production car being Y5632LCV. The first car to be sent to the USA was Y6144LCV. All early convertibles were assigned for export with no UK orders being allowed until August 1960, considering the convertible was launched January 1960, and August being at the end of Summer, probably not one of Standard Triumphs best moves. Export figures for the US stood at 2,822 and 960 cars headed off to Australia with big exporters such as Belgium, Canada and New Zealand yet to be added into the equation it no wonder there are very few UK cars now, simply because there were very few UK cars then! Surviving Coupes now stand at 153 with the latest Y5351, originally owned by the prime minister of (then) Ceylon, now Sri Lanka. An overdue update, but still the information is being compiled. Firstly a milestone in reaching 150 surviving coupes worldwide, with a couple more currently awaiting photos to add to that tally too! it seems to tell the story already of how few coupes were available new becuase they were exported everywhere. New additions to the YDU range of cars which were registered in Coventry have been updated swelling the 'Y' section and taking the details of cars on the database to 3,413. And finally new details for Jack Brabhams tuned coupe have been unearthed, we still need to finalise the info before we go public - we'll keep on hunting! as some of the finest. which were black and white and the grainy video. Now I have 100+ 'new' photographs!! like it was photographed last week! The quality of the scanned slides is superb. So enough of the rambling - heres a link to one of the photos: New Tangiers Photo Many more posted soon. and How to top that? Now then, what to scan first?! July has been a busy month, perhaps with the 50th anniversary more and more enthusiasts and cars are being found. Firstly 5 new coupes have been added to the existing list, which takes the tally now to 143. All 5 coupes were photographed recently at a show in Australia; four being, 00657H, 00862H, GRA059 and A16159. The fifth car we cannot identify with any registration plates or numbers so we have added it to the Spotters Area, or ready with its own page here. The car is in mid-restoration and is with a red bonnet and lots of primer ready for a new top coat. We are actively compiling the records of Triumph Heralds featuring in motorsports from the Monte Carlo rally, to RAC to the Tulip and Alpine from 1959 through to 1961, and shall add a comprehensive section to the archive once completed. We weren't aware of so many outright victories. We knew of the controversy of the 1961 Tulip Rally win, but Triumph Heralds also won the Scottish rally with Sandy Morrison in 1959, again in 1960 by Andrew Peattie (with Morrison second) and the Rally of the Vales (A Griffiths) in 1961. With accurate information from period magazines, archive material and information from participants and ST competition department, this new motorsport area is proving to be very exciting indeed. Stay posted. Next, a new image of TN14, the Tony Nash Coupe from the 1960 RAC rally. The car retired after an accident and can be seen in a pretty battered state. 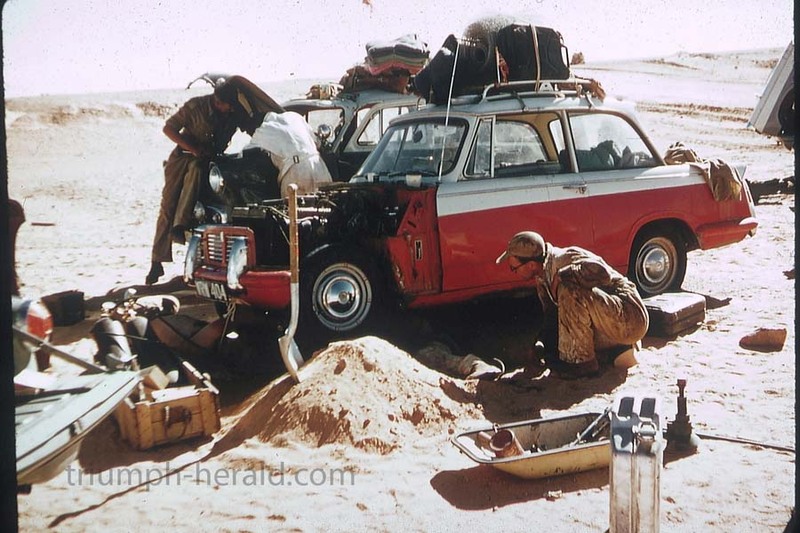 Imagine taking a Triumph Herald Coupe 500km around the Nurburgring in 1960? Driven by Richard Izard and Wolfgang Daewel did exactly that finishing 19th. Not just Coupes - Saloons in Motorsport too! It's true, many events also featured single carb saloons. Car no. 143, UFN was such a car to run in the 1960 RAC rally. Finally, with this incredible month for information, the Coventry Evening Telegraph, were good enough to include our request for information relating to the launch of the Herald in 1959, in a recent edition. Many ex-Standard Triumph workers and their families still live near to the factory site, so the article will, no doubt, bring back some memories and we've invited everyone with a story to get in touch. The response has been excellent already and this will also feature within the website soon.